David and Kate Decatur in the swing under their famous cherry tree behind their home. 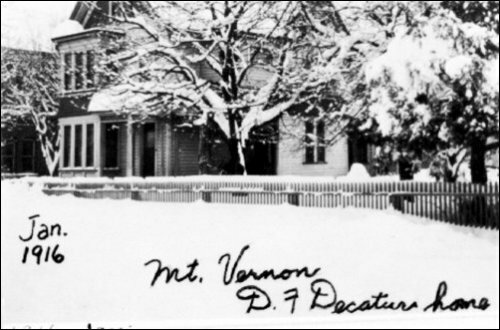 David F. Decatur arrived at the Mount Vernon steamboat dock in December 1887 after a long train journey from Boston over an unrecorded rail line. He soon became one of the most important town settlers before the 1891 fire and built the first sawmill in town. You haven't heard of him? That's not surprising; except for a very flowery paid biography in the 1906 Illustrated History of Skagit and Snohomish Counties [hereafter, the 1906 Book, very little was recorded about Decatur. But if you have ever attended a movie or event at the Lincoln Theater, you have sat almost exactly where his house stood. Luckily for us, his great-grandson John Pollock found our website in November 2003 and has shared with us some of the earliest Mount Vernon photos ever seen. Decatur was a very successful storekeeper in Boston, where he was listed in the 1880 census as a "provisioner." The only clues that we have about why he moved here are two family stories that Donald Pollock, John's brother, remembers. One is that a friend or relative in northern Whatcom County, perhaps near Lynden, corresponded with Decatur about the opportunities in this area. Another is that an unnamed relative was a postmaster at or near Anacortes sometime in the early 20th Century. Donald's father recalled travelling from his home in Seattle to visit his grandparents in Mount Vernon and continuing on to Anacortes by rail. John and Donald are sons of Elden D. Pollock, who was the grandson of David Decatur and who spent most of his life managing the theater property, as we will explain below. David Franklin Decatur was born on Jan. 6, 1838, in Barrington, NH. We warn readers that there are major sections of the 1906 Book profile that have been disputed by Decatur decendants. Some details were so far off that we pulled our story initially to correct the mistakes that were made. First of all, the biography includes a claim of kinship to the famous Commodore Steven "my country right or wrong" Decatur, but John Pollock demurred. This photo on page 115 of the book, Skagit Settlers, is of a mill at the Skagit river waterfront. It is labeled, Reed and Freeman Shingle Mill, 1898, and it shows what a mill of that era looked like. The late Roger Fox, Mount Vernon barber and photo collector, told us that the mill stood at the location of the Moose Lodge on the revetment of the Mount Vernon waterfront. "David's father, Cyrus Cater, changed his last name to Decatur but all of his siblings retained the Cater name. Our well-documented Cater ancestors came from York, England, to New Hampshire about 1670; more than a hundred years before the family of Stephen Decatur came to America." "The family reunions have always been on or near the site of the Cater family homestead in Barrington. David did indeed attend some of these; whether he did so after settling in Mount Vernon is not known. Edith Mabel Decatur attended several, as did David's granddaughter Barbara Pollock. . . . These continuing reunions now hold the record for the longest consecutive family gatherings in the US." The 1906 Book information about David's mother, Olive, also seems to be incorrect. We do know that her family name is referred to as both Woodhouse and Woodes and that she was born in Savannah on April 7, 1807. We wish we had more information about David's younger years, but we do know that he moved to Boston around 1860, where he enlisted in the 35th Massachusetts Infantry on Aug. 22, 1862, serving under the hapless General Ambrose Burnside. A month later, he was wounded several times and his lower leg was amputated at the Battle of Antietam. Burnside is generally blamed for allowing Lee to escape while Burnside was commanding the left wing of Gen. George McLellan's force. Decatur returned to Massachusetts to recover from his wounds and joined the reserves, attaining a commission as captain. He stayed in the reserves until 1883 and was always addressed here as Captain. Before David enlisted, he married Kate Morrison — a native of New Brunswick, Canada, and a year older — on Dec. 31, 1861, at Harvard College in Boston. She was a Scot like David's mother. The 1906 Book claims that Kate's father's side of the family traced their lineage back through the Highland chiefs who fought the English in the thirteenth century under William Wallace, but that has not been confirmed. A son, William Burnside [named for the general], was born in 1865 in Boston. A daughter, Alice Elwyn, followed on June 28, 1867, and the last child, Edith Mabel, followed on Oct. 8, 1871, both also born in Boston. Soon after arriving in Mount Vernon, Decatur bought a homestead but eventually sold the land at an unknown date. David Kimble, one of the original settlers, owned a homestead up to what is now Pine street and Decatur bought the block east of First street below Pine for his home site. According to researcher Tom Robinson, Decatur's house was probably located across First from Kimble's home. Decatur's fine two-story home was set back on the block where the Lincoln Theater stands today. 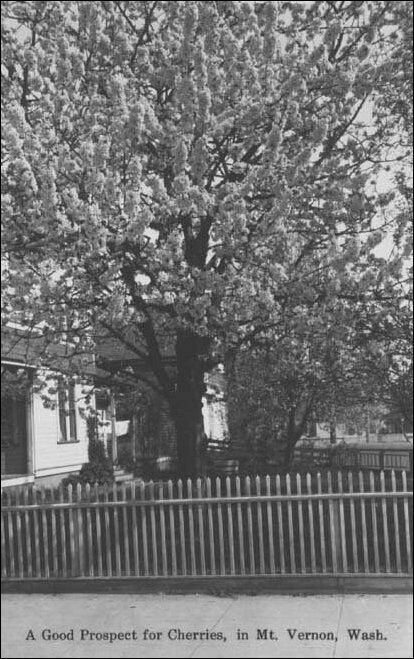 His spectacular cherry tree was a longtime landmark until it was cut before the theater was built in 1926. Left: All the photos on this page, except for the one of the 1898 sawmill, are from John Pollock, the great-grandson of David Decatur. This is the earliest of the photos. We are looking north-northeast on South First street. The only readable sign we see is on the building on the east side of the street that seems to read, "The New York Store" and advertises Levi Strauss pants. Unfortunately this is no record of such a store so we do not what year the building was constructed. We do know that the photo was taken before 1893 when that building was replaced by the first county courthouse. With the concurrence of researcher Tom Robinson, we are estimating 1888-91. Most interesting is the apparent fork in the muddy street of the photo. We went to the intersection and consulted maps and we now know about the fork. First, we know from original records that First street was designed to lay parallel to the river rather than running north-south. 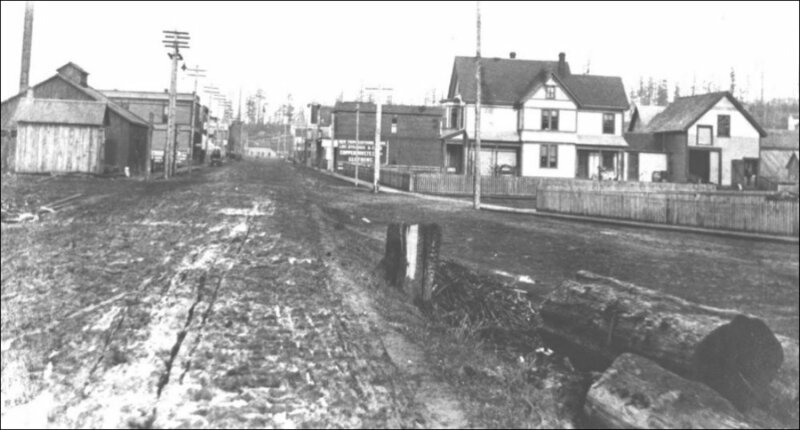 The right tine of the fork in the photo is the present Cleveland avenue, which extended due south from the end of South First at Kincaid. When the photo was taken, South First street also extended south-southwesterly down on the diagonal below Kincaid. That makes up the left tine of the fork. If you look on a map of Mount Vernon streets, you will see that this one-block, diagonal section of South First below Kincaid no longer exists. But South First continues again on the same diagonal below the intersection of Broadway..
Center: This photo, showing the Decatur house, was taken prior to construction of the first courthouse in 1893. Kincaid Street is on the right.. Right: This photo was taken sometime after the courthouse was built in 1893 or possibly during the construction itself.. The Skagit Saw-mill and Manufacturing Co. The story of the sawmill is told in the more reliable section of the book that was based on actual research of period newspapers by journalist Harry Averill. 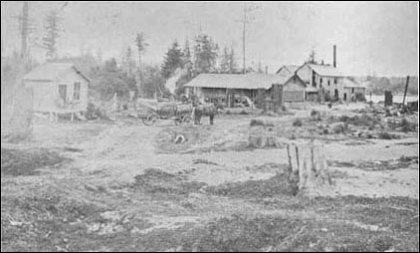 Back in 1887, a group of early settlers incorporated the Skagit Saw-mill and Manufacturing Co. at a public meeting on April 16. Joining the town founders, Harrison Clothier and E.G. English, were Dr. H.P. Downs, Otto Klement, Jasper Gates, G.E. Hartson, E.K. Matlock and Orrin Kincaid. A total of 400 non-assessable shares were subscribed at $50, so the company was originally capitalized at $20,000 value. 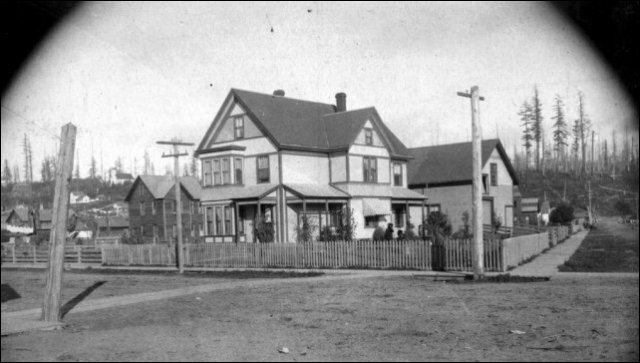 Over the winter the corporation was inactive but by June 1888, the officers decided that newcomer Decatur had the right stuff, so they committed $2,700 to purchase a site on the waterfront. We are not sure where this site was but we suspect that it was near where William Gage had his logging camp. Tom Robinson surmises that the camp was near the Washington Hotel, which stood near the east entrance to today's bridge over the Skagit. They constructed a boom for holding logs. Decatur built a sawmill from equipment that John Pollock says was ordered back East and the shipping was arranged prior to the family leaving Boston. The steam boiler supplied 80 horsepower for a planer and a shingle machine. His mill soon had a cutting capacity of 35,000 feet per day and shingle capacity of 50,000 per day, along with a lath mill. Decatur made a deal with the corporation to operate the mill for five years but by 1891 he sold out to the town founders who took on operating partners, Dunham & Collins. That was the beginning of Ed English's future timber empire that eventually encompassed sites all over Skagit and Snohomish counties. 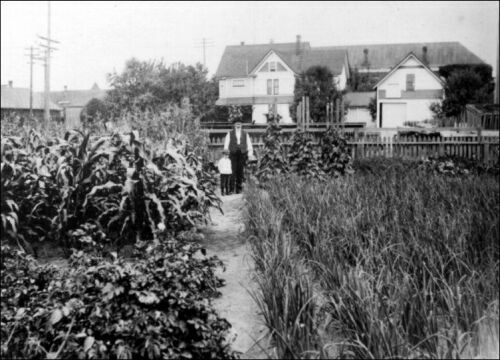 Far left: David Decatur with grandson Elden D. Pollock in the midst of row crops on his farm south of Kincaid street. Decatur's house and barn are behind them across Kincaid and the courthouse is in the background. 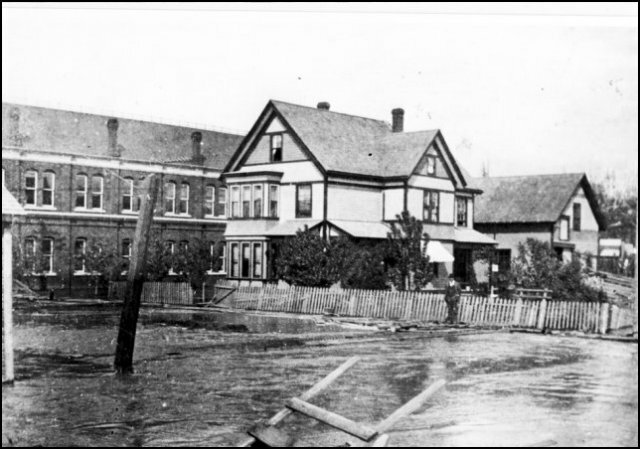 Since Elden looks to be about six, the photo must have been taken in about 1906..
Center: This photo was apparently taken in the Teen years, from in front of the Decatur home, looking north up South First Street. A reader who knows vehicles might be able to narrow down the years. The Rex sign to the left may have been for the Rex vaudeville theater.. 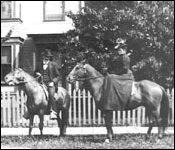 Right: This photo shows David and Kate Decatur on horseback in front of their home, sometime in the 1890s.. Early town father By 1890, Decatur had established himself as a town father. At a meeting on February 11, a group of civic lights formed a committee to urge incorporation, with Decatur as one of the trustees. In April, he headed a petition to the Skagit county board of commissioners with a hundred signatures, which requested incorporation as a city of the fourth class. The formal vote was held on June 27, 1890. In November he stuck his toe in the political water and got it bruised. Running for county treasurer, he was thoroughly trounced by the Rev. B.N.L. Davis, Democrat, who received 1,018 votes. Republican R.O. Welts got 779, and Decatur, who ran on the Prohibition party ticket, received just 78 votes. In spite of the hard times, the county commissioners carried on a number of important enterprises, one being the erection of a court-house on the corner of Pine and First streets on land purchased of D.F. Decatur. The plans of W.A. Samms of Avon were accepted. The dimensions of the building were to be fifty by one hundred [feet] . . . with two stories and a basement, and the contract for its construction was awarded to R.S. Downer and William Peacock for $13,585.00. Work was begun immediately. The courthouse still stands at the southeast corner of Pine and South First streets, north of the Lincoln Theater, but the top story was lopped off sometime after 1909 after a fire. 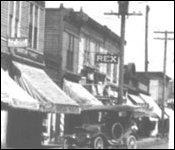 It was replaced by the new courthouse at its present location on Kincaid street in 1923 and has housed many different businesses over the past eight decades. Far left: This postcard, probably from the Teen years, shows the famous Decatur cherry tree that was a landmark until it was cut down for the construction of the Lincoln theater in 1926..
Center: This photo of the Decatur home was taken during the famous January 1916 snowstorm. Over a 30-day period in that winter, the town was cut off from all communication with the outside world and the river froze over so steamers could not navigate.. 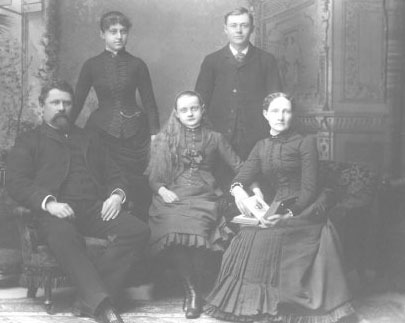 Right: This photo of the Decatur family was taken in April 1886 in Boston. 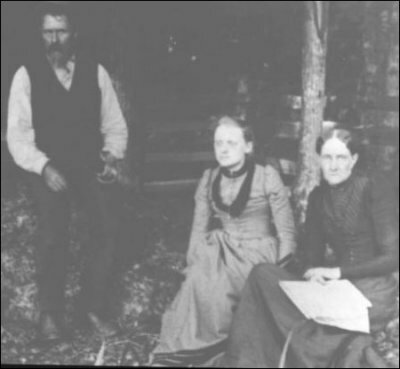 From left to right, we see David, Alice, Edith, William and Kate..
Farm, cranberry marsh and timber claim By the time that Decatur sold the sawmill in 1891, his attention had branched out in three directions. First was what was sometimes called an "experimental farm," which was centered on the blocks south of his home, roughly the area now covered by a bank, grocery and city hall and fire department. He volunteered for the board of the new Horticultural Society in 1894, the group out of which would soon grow the Skagit County Fair. Capt. D.F. Decatur of Mount Vernon, a well known property owner in Skagit county, is at the Diller and will remain in the city for several days. The captain owns a big cranberry ranch in the Pilchuck country, which he says promises soon to pay him big revenues. He reports that Skagit county is "all right" and times are picking up. The captain is also interested in agitating building of an electric line from McMurray to Mount Vernon capable of carrying freight as well as passengers. This proposition was discussed quite freely about three years ago, but was dropped temporarily when the hard times seized the country. The captain says that now or never is the time to build the line. It will pass through a rich agricultural and timber district and will open up quite a new territory. It is estimated that $25,000 would start the concern and place the line in operation. "On Aug. 24, 1891, Capt. Decatur filed a homestead Land Patent at the Seattle Land Office for 160.46 acres, sale-cash entry. It was for land on the way between Little Mountain and Big Lake in Section 2, Township 33 North, Range 4 East. His son and older daughter filed similar claims on land adjacent to the northwest and easst; his wife filed on the western 1/4th of Section 7, Township 33 North, Range 5 East." John believes that these properties were sold as soon as possible after they were proved up. That region became a very hot timber area after the Seattle Lake Shore & Eastern railroad connected the two lakes on its West Coast branch that ran from Seattle to Sumas. Donald Pollock is researching that aspect of the old family lands and hopes to soon have some information about the timber claim's disposition. "The house was later moved to a lot on S. 2nd St. about three blocks south of Kincaid, across from the Casa Grande Apartments (where my folks and I first lived in Mount Vernon)." Donald Pollock recalls a story from his childhood in the 1930s that is the first explanation we have read about the naming of Pine street: "As a six year old I went to the Mount Vernon Library. It was on the south end of the ground floor of a combination Fire Station, City Hall and Library building located to the east of a park at Cleveland and Broadway. The librarian, an older lady, took me outside the library door. She pointed out a large cherry tree and pointed out a big branch. She told me that that branch was a graft from a tree that had been on my great grandfather's home two blocks north. She also said that Pine Street had been so named because of pine trees that the Decaturs had planted along the north side of their yard." 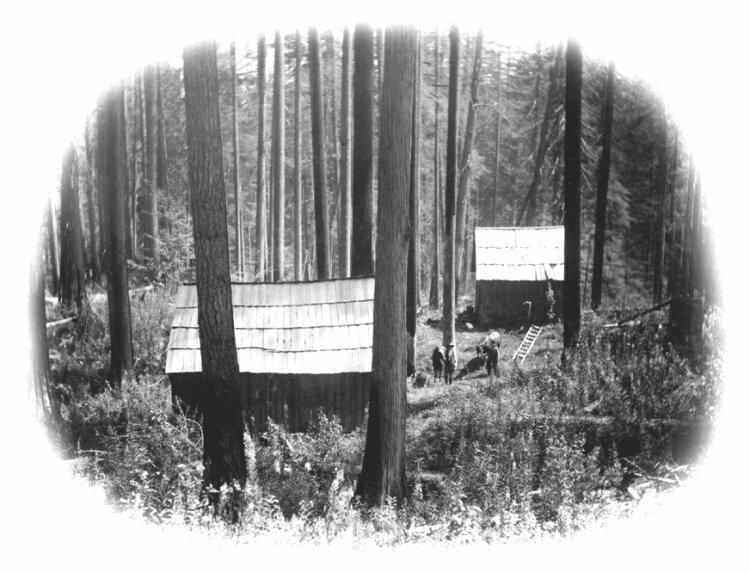 Decatur timber claim at the southwest end of Big Lake, probably in the late 1890s. Click on thumbnail for larger photo. "He eventually returned to Seattle, and became a reporter for the Seattle Post-Intelligencer. He was sent to Alaska to report on the Gold Rush. He returned to Seattle, married Alice Decatur, David's older daughter, and returned to Skagway. My father, Elden Decatur Pollock, was born there on December 8, 1900. Elden W. later developed part of the Decatur family homesite in Mount Vernon, building the Lincoln Theatre and the half-block of surrounding storefronts. According to John Pollock's family records, by 1906, Elden W. "had returned from Skagway to Seattle. He had two more children, moved briefly to Chicago where he founded an appraisal business, returned to Seattle where he founded The General Appraisal Company, which he sold to his employees in the 1920s. [The Lincoln block properties went to] Alice Decatur Pollock after her parents died, then to her sons Elden, Robert and David Pollock after her death. 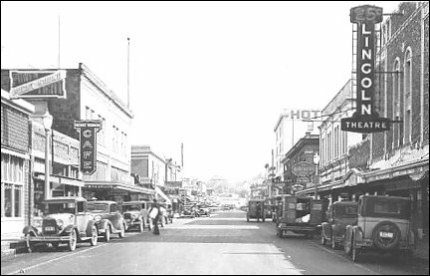 This photo of S. First street in the early 1930s contrasts with the earlier photo above and shows the Lincoln theater at the right, which was built in 1926. "I was born in Seattle but moved to Mount Vernon shortly thereafter when my [parents, Elden D. and Mary] moved [our family] to Mount Vernon to 'temporarily' manage the Lincoln, as the tenant had grown sadly delinquent in paying rent. Temporary turned out to be [sixty] years; my father passing there in 1992. 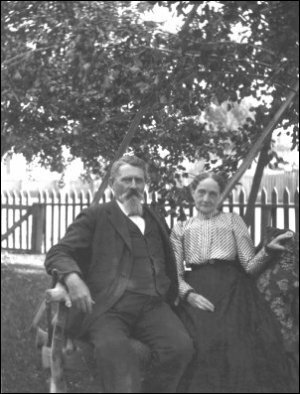 My father frequently visited his Decatur grandparents, and would later introduce us to several elderly members of pioneer families. We enjoyed driving him around the county where he would point out landmarks and events from his childhood." Elden D. was married in Mount Vernon on July 17, 1930. He had visited his grandparents in Mount Vernon on many occasions, but he lived in Seattle and did not move to nor live in Mount Vernon until 1932, according to John. Elden and his brothers, Robert and David, became co-owners of the property, and Elden acted as resident manager of the theater. Edward Pollock, John and Donald's youngest brother, managed the other family properties on the block, but did not manage the theater itself, as is erroneously reported in many sources. The theater was sold to the Pickett family in the early 1980s and the theater foundation was formed in 1987 to provide a community financial base for restoration of the property. "I have an early copy of the Mount Vernon Argus when Elden W. Pollock was the publisher. The front page is almost entirely an article describing at horrendous length the first occasion of what evolved into the county fair. Several ribbons were awarded to David D. for things from his garden." 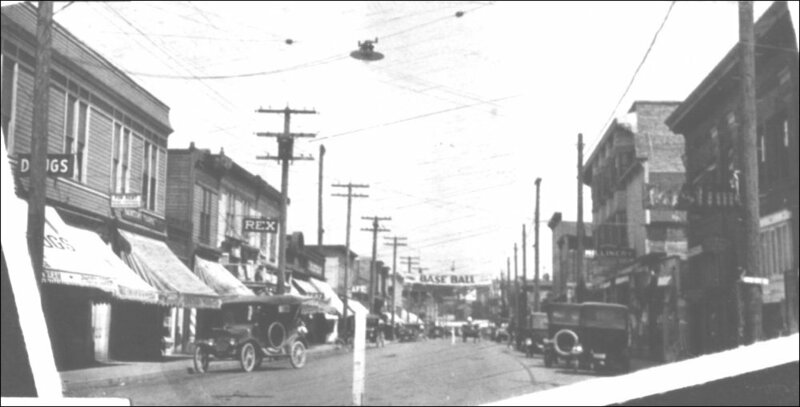 The first county fair was held on Oct. 3-5, 1901, a boom year for Skagit county, someplace in the Riverside area. We will publish an article about the history of the Lincoln Theater in the near future, but for now we hope to convince several websites, including that of the theatre foundation itself, to give proper credit to David Decatur's family for its role in this fine theater's long history. The Lincoln is the last remaining theater from that glorious time before the Crash of 1929 when impresarios built grand palaces that recreated that social gathering that dated back to the beginning of time: families and tribes huddling together to watch flickering shadows on a wall. A group of hard-working volunteers has managed to keep the theater afloat now for 16 years and has restored it in spectacular fashion, including the famous Wurlitzer organ. We plan to update this story over the next few months as the Pollock family finds more material and readers add details and photo scans from their collections. This story has been carefully checked and is the most complete profile of the family that we have at this time. This is a photo of the Decatur home, where the Lincoln Theater stands today, and the new courthouse building behind it. You can see the flood damage on First Street in front of the house. We are looking northeast. We know that the photo was taken after 1893 when the first county courthouse was erected. At some unknown later date, the courthouse became known as the Matheson building, maybe when the upper story was dismantled, resulting in the building that still stands today at the southeast corner of Pine and First streets. 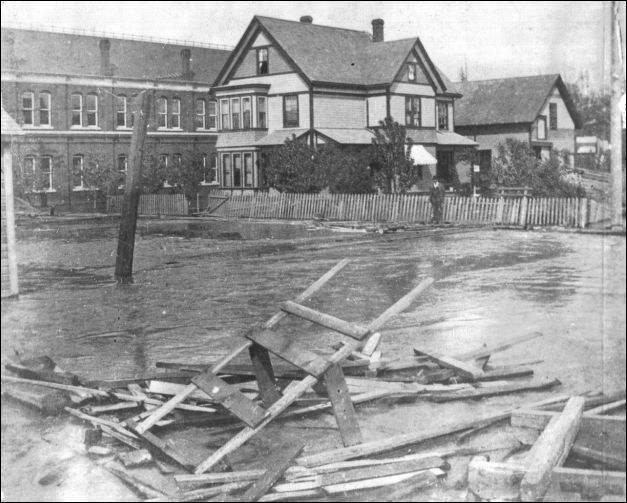 We are guessing that this photo was taken during one of the monster floods of the 1890s, when the Mount Vernon waterfront was torn asunder, as were the shorelines of upriver towns such as Sauk City and Hamilton — either 1894, 1896 or 1897. Photo from the collection of the late Roger Fox, scanned and loaned by Larry and Josef Kunzler, from their www.skagitriverhistory.com website, which features dozens of old photos, especially those from Skagit floods, the main subject of their website. A 1940 history of the settlement of the Mount Vernon area from 1870 on and the beginning of the town. This story will soon be changed to this address. If neither file connects, please email us. Our exclusive profile of Harrison Clothier and the birth of Mount Vernon, the town he founded with Edward G. English in 1877. See the link for Part Two added this year, about his parter Edward English, who became a leading logging magnate, plus Clothier's later years. A collection of early Mount Vernon photos. Do you have copies or scans of such photos to share for this section? This story will soon be changed to this address. If neither file connects, please email us. Are you associated with Lincoln theater? We would like to continue with details of construction of the theater. We also plan to follow the Pollocks' other theater activities, especially the Drive-In that used to stand where Cascade Mall is today. Many of us still miss that hokey old drive-in.